Our first year in France, I'd read that Saint Nicolas was going to be at our local grocery store one Saturday for an hour. Alex grabbed his precious newspaper cutout of a plastic backhoe, and I loaded a reluctant two-year-old Ellie into a cart. Bernard and I agreed 10 euros was our max for the photos. At the entrance, the store manager informed us there was no line. In fact, dear old Saint Nick wasn't stationed anywhere. He was roaming the store, and they had no idea where he was. Trying to think like Santa, we hit the toy aisles. No luck. We checked in the chocolate and cheese aisles, veggie and pasta aisles. Still no Santa. At the back of the store, Bernard asked a woman at the watch counter where we’d find Saint Nick. She shrugged, and directed us to the accueil, the main front desk. Or perhaps he was on his coffee break. After all, it was an hour-long assignment. We continued racing from one aisle to another, telling the kids to hunt for that famous red suit. However, the employees in this store wear vests that are Santa red, and the place was Super Wal-Mart size. Bernard asked another employee who helpfully told us to check the accueil. I was ready to tell the kids there was no Santa. 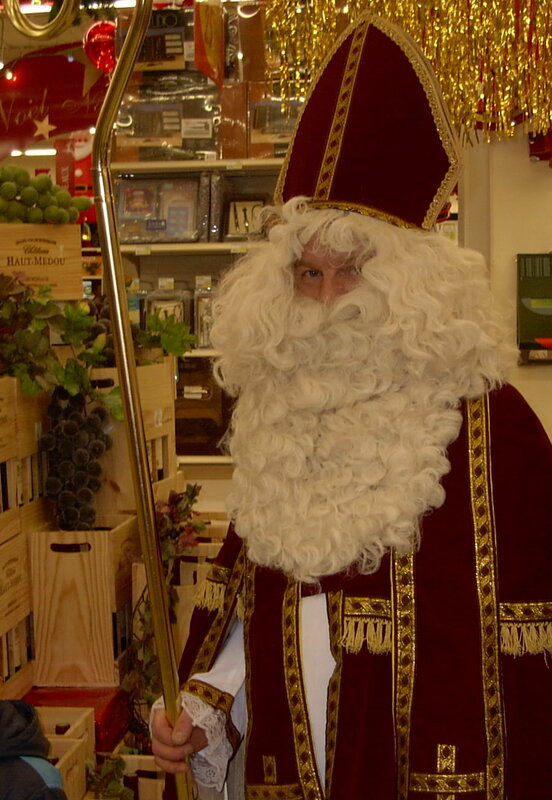 However, we finally found Saint Nicolas hanging out near a big wine display, chatting with the store manager. His costume was beautiful, and I stared at it in astonishment, realizing I’d made a stupid assumption. It was December sixth, Saint Nicolas Day, and our elusive "Santa" was more in his likeness than the Coca-Cola version. Saint Nick smiled for the manager's shots, as well as for two we took on our own camera. A few other children paused to look at him, and continued on with their parents. The manager said we could pick up our free photos the following Tuesday. It's always a pleasure to grab your american look upon our french way of life. See you !